You can’t go past a tasty apple strudel in winter, it can be made as a traditional roll or as individual strudels in soufflé dishes. If you are making them in soufflé dishes only use four layers of filo pastry. Makes one roll or six individual strudels. 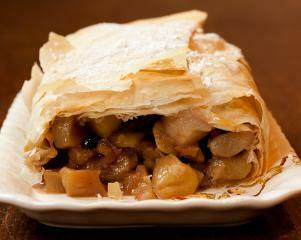 Remove the filo pastry from the fridge and heat the oven to 165 C / 330 F.
Peel, core and chop the apples into small pieces. In a mixing bowl combine the currants and the brandy. In a hot fry pan melt half the margarine and half the sugar, then add the apples. Sauté for about 5 minutes until the apple is softened. Remove about 3/4’s of the mixture and add to the currants and brandy. Add half a cup of water too the remaining apple and leave to cook until completely soft. Finely chop the walnuts. Add the walnuts and spices to the apple and currant’s mixture. Mash the softened apple in the fry pan to make a thick sauce, adding more water as necessary. Add the apple mixture from the bowl back into the fry pan and cook for one minute until the smell of the brandy has cooked off. Set aside. Melt the remaining margarine and sugar. Unroll the sheets of pastry and brush every second layer with melted margarine and sugar. I make the strudel in a loaf tin because it hold its shape better, but a baking tray is fine too. Press the layered filo pastry into the loaf tin. There should be enough pastry to overlap by an inch or two on top, if there is any excess cut it off and place the pastry in the base of the tin. Spoon the apple mixture into the loaf tin and wrap the pastry over it. Brush a little of the melted butter and sugar to make it stick and a little more for the top.